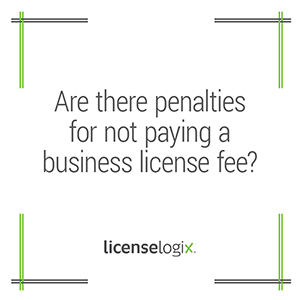 Yes, there usually are penalties for failure to pay a business license fee. Penalties can include fines, accruing interest to the license fee, and in some cases, license suspension or revocation. LicenseLogix's ongoing compliance tool CLiC will ensure that your business files every renewal and pays every license fee on time. For additional help you can fill in the form on the bottom or give us a call at (800) 292-0909.